Rhythmicality Fairy and Princess school parties are tailor made to bring to life a personalised fairytale story that your child will love as they are transported into a world of magic. You are visited by a real Princess/Fairy who will take you through the Rhythmicality school and teach you and your friends how to be real Princess/Fairy. These interactive parties are for girls from 4 years. 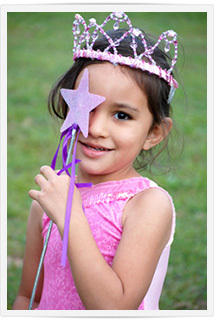 The unique 2 hour party includes Wand/Tiara making, Make over, Singing, Dancing, Drama, Games, Learning to Fly and lots and lots of Fairy and Magical Dust to keep your child mesmerised in the action from the beginning until the end. At the end of the party you are awarded with a Rhythmicality Princess/Fairy school certificate in our graduation ceremony. Prices from £100 including all craft materials, music and magical back drop. *These parties are for girls but if you have a little brother or friends who are boys who want to attend please enquire. Subscribe to our newsletter to receive our latest offers and updates. Copyright 2016 rhythmicality. All Rights Reserved.